One of a range of kit speakers from "Audio & Technique"
In this series of kit speaker reviews I've tried to choose models a little out of the ordinary. However in the PMT (unfortunate name that) I've found one of the real individuals of the kit world. Most speakers, particularly kit's, which have to be easy to construct, are based on a simple rectangular wooden box. 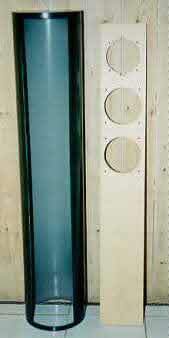 The PMT is based on a length of plastic sewer pipe. The thinking behind this is supposed to be that a curved enclosure will suffer less from standing waves as all distances within the enclosure are different. That this is the case is indisputable, though a properly proportioned rectangular box is not far behind in this respect. No, I suspect the primary reason for using the tube is that it allows for a suitable enclosure that is very easy to construct at a stupidly low price. The question of the price of the PMT is important. Here we have a very compact floorstander with three drive units a side that comes in at 295e. The kit is comprehensive in a way few others are. It includes everything you need for making up an enclosure - drivers, crossover components, damping materials, fixing bolts, cables and even glue! Once complete the PMT just needs a coat of spray paint to finish. When put next to the hulking shape of the IPL S3MTL's (see pic) which cost only a little more, they look very poor value. But add up the cost of the IPL's cabinet and finishing not to mention man hours, and their price goes up to at least 50% more than the PMT's. 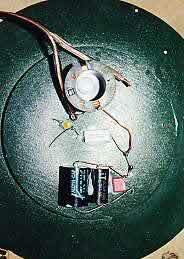 Though much of this low cost is accounted for by the enclosure the rest is obtained by use of cheap drivers. The PMT's use two tiny bass/mid drivers a side. These are from Tesla and are the sort of thing you see in better computer speakers running "full range". This means that they're made in their tens of thousands and are therefore "cheap as chips"... The fabric dome tweeter is likewise a pretty cheap affair but at least a proper tweeter for all that. All drive units have substantial magnets, the bass/mid units having thin pressed steel frames but all are shielded. Supplied with the kit are two lengths of sewer pipe cut to length, a piece of high quality birch ply cut to size for the baffle and three circles of MDF. Building the enclosure from this is simplicity itself. Finding a true perpendicular line down a tube is not as easy as it sounds, but luckily each tube has manufacturers writing running down it and this make the perfect guideline. Next you have to work out the width of the slot. Here the suggestion is that you cut a template from paper and draw round it. Now the obvious way of doing this is to trace round the baffle and cut out the shape to make the template. If you do this the slot will be much too narrow! Obviously the tube has a curved surface, the baffle a flat one - it don't work... You need a pair of callipers to measure the width of the baffle then transfer this to the tube and mark out. Doing this the slot was perfect, needing no filing at all. Really APN need to address this by giving at least the dimensions for a paper template. Once the marking out is complete drill a hole in each corner and cut the slot with a jig saw. Next comes the preparation of the baffle. Here you need to cut out the driver holes and fit the captive nuts for the driver fixing bolts. All basic jigsaw/drill work. This assembly is then just forced into the slot - the tension will hold it in place, and glued by spreading loads of the supplied 'rubbery' glue to make the baffle airtight. The snag here is that in cutting the slot you end up with a 90-degree surface on the cut which leaves a rather ugly gap where the baffle fits. There are two solutions. Either file the cut surface to the correct angle, or if you have access to a router, cut a V-shaped groove along both vertical edges of the baffle which the sides of the slot then clip into. This is what I did and I'd strongly recommend APN to supply the baffle slotted like this. It makes a very neat join and the slot can be filled with glue (see pic) ensuring an absolutely airtight seal. Once the router was set up it took approximately two minutes to do both baffles so I can't see it effecting the price and it makes assembly much easier. However before gluing up it's best to spray the enclosure and MDF circles. I also waxed the baffle, which took five minutes and was all the finishing it required. All that is left to do is to glue the top circle of MDF into the tube and push fit the bottom circle/base to complete the enclosure. I've made many speaker kits, but this one took a total of two hours to compete both enclosures, nothing else comes close! Having made sure it all fits OK it's time to solder up the simple crossover. This is "hot-melt" glued to the bottom circle (see pic). The kit includes some proper speaker wire and this is all soldered up to the drivers and down to the crossover and thence to the high class binding posts supplied. With the IPL kit there was supplied a simple drawing of the crossover soldered up. This might be an insult for anyone with decent knowledge of circuit diagrams, but for those whose knowledge of electronics could be written on a drawing pin with a pneumatic drill (i.e. me) it would have helped to have had a similar drawing with the PMT's. New speakers generally sound pretty poor when first fired up and the PMT's were particularly bad in this respect - they sounded like a transistor radio, and a cheap one at that. Thankfully those little cones took very little time to break in. Given about 10 hours of music they started to sing. Their one outstanding quality is their imaging. Tiny floorstanders with very narrow baffles and low colouration cabinets should image well but these were exceptional. I'd go so far as to say they bettered even the Cabasse Sloops in this respect - no mean feat considering the Sloops price (1,500 pounds) and hi-tech dual concentric drivers. The PMT's generally light and airy presentation helps give the soundstage space, but in it's width and depth it really set a reference point in my system. You wouldn't expect such a small speaker to produce deep bass but what it does produce is tuneful and fast, the sealed box providing a smooth controlled roll-off, wall re-enforcement helping here. Next to the IPL's they lacked anything in the way of low bass but those tiny drive units still surprised further up. The midband was clean and open, hence the imaging, with good detail retrieval. At the top end things were a little less happy, the tweeter being "spitty" at times, certainly with female vocal syballents, Cymbals a little 'splashy'. There is a certain implication on the website that the PMT's are suitable for low powered valve amps. Quote "The frequency response is 50 Hz - 18000 Hz and sensitivity is over 90 dB's. A simple 8 or 10 Watt amplifier will thus give a sufficient sound level". I'm sorry but this isn't the case unless you listen to gentle music in a cupboard. Efficiency is quoted at 90+ db's but I suspect that is pretty optomistic, I'd say a more honest figure would be 87-88 db's. In addition the impedance curve, though commendably flat, resolutely sits at 4 ohms. My own 30 Watt Audion valve amps managed to get reasonable levels in my 6x4 metre room but only when connected to the 8 ohm tap. Using the 4 ohm tap reduced levels considerably though the sound filled out somewhat. Here we have a very cheap kit, certainly the cheapest floorstander that I have come across. It uses cheap drivers and a very simple to construct cabinet. In its favour, the kit is complete and an absolute doddle to build. However I do see the PMT's as something of a niche product sonically. In some respects they are outstanding, their imaging is simply superb and a well judged midband brings out the best in small-scale music. What they don't do is "scale". Limited maximum spl's and restricted bass mean they founder during big orchestral climaxes or rock anthems. To be fair I'm sure that this is precisely how they were designed. For jazz, female vocal and lighter classical works they are ideal, particularly where space is at a premium where they will not excite a small room, yet produce images that seem to demolish the wall behind them. For those looking for an AV system I can imagine that four of these with a suitable subwoofer would manage that rare feat of producing decent hi-fi as well as surround sound. We are very glad with this article published on one of the finest websites in the audio world. But ........ there are some comments to be made! The circular form has the advantage of superb strength in horizontal directions. Furthermore PVC is a "thermoplastic", i.e. it converts pressure to heat. In loudspeaker cabinets these advantages mean that very few additional sound is produced by the cabinet so the coloration factor (from the cabinet) is low. 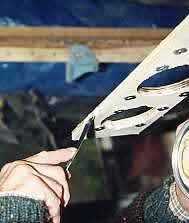 A motorized jigsaw can saw with an angle. In this way you make a perfect fit. I strongly oppose to the "V-shaped groove". The advantage of a circular form connected neatly to the front of the baffle is that "diffraction" is kept at low level. Hence the stereo imaging is better. With the groove the units "see" an obstruction at the sides which will add diffraction. A 'closed' cabinet lacks bass power in the lower octaves. But a closed cabinet dampens itself, there's less need for damping from the amplifier. Most tube amplifiers have relatively high output impedances and therefore few damping. A closed cabinet also adds much less bass harmonics then "open" systems do. The PMT is 4 Ohm and will perform nicely with tube (or transistor) amps of 20 Watts and up, although we demonstrate them with a 12 Watt SE design, no problem there! NOTE by Geoff Husband - The V-shaped "slot" I routed in the baffle was right on the edge and only the depth of the plastic pipe's cut surface. As a result the transition from tube to baffle was perfect, easier to make and far stronger - I still consider this to be the best method of construction. With respect to efficiency, APN will hopefully alter the quote on their website.